Malaga city offers a large variety of hotels, hostels and apartments for every pocket and taste. Lots of old buildings have been renovated and now shine in their original glory with modern facilities. Most of the upmarket hotels are situated near the city centre, whereas economic hostels can be found in nearly each quarter of Malaga. There are a lot of websites offering Malaga hotels, but we recommend you to have a look at www.malagaholidays.com, a local travel agency that provides many deals and discounts, especially for Malaga, Marbella and Sierra Nevada. The tourist resorts along the Costa del Sol offer a wide range of accommodation, as befits its status as one of the most visited tourist destinations in the world. You can stay in five star hotels in Malaga, sumptuous villas, apartments in Malaga... there are plenty of opportunities and locations to find the lodging that best suits your requirement or budget. Most four star hotels in Malaga and all five-star hotels have excellent sports facilities, gym, beach club and spa with beautiful views and subtropical gardens. Some holiday resorts have a lot of activities and entertainment. Most hotels and apartments are located near the beach. 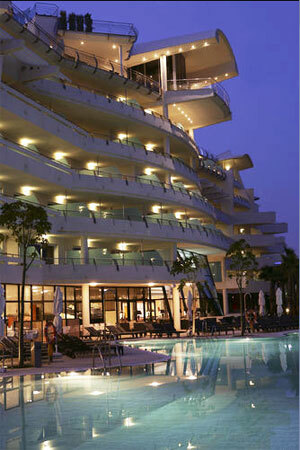 Apart from Beach Hotels, the Costa del Sol offers as well a wide range of Golf Hotels with excellent facilities. Very good Hotels in Malaga city for city breaks and located close to all the important sights and museums are the Hotel Molina Lario and the recently opened first and only five star hotel in Malaga Vincci Selection Pasada del Patio. Spa hotels in Malaga are a perfect way to relax, for a weekend getaway or several days for a full treatment. The places that offer such services have sauna facilities, Jacuzzi, swimming pools, showers, ice showers and rest and relaxation areas with massages and beauty treatments. If you don't know how to get to your hotel, you could book a Malaga airport car hire or maybe you would prefer a more pleasant journey by booking Malaga airport transfers services.